Oh Soho, you are always so lovely! Whenever I'm in New York City I have to make a trip to this popular shopping district. All the famous fashion designers have their latest and greatest on display at their Soho stores. The unmistakable architecture of the buildings and the historic cobblestone streets make this part of the city so memorable. We had a lovely time walking through Prince and Spring Street, and my boyfriend even picked up a little Armani for himself! Travel Tip: Flights to New York City are super cheap the week after New Years. We paid less than $450 for 2 roundtrip flights from San Francisco to JKF Airport. The weather is cold and there could be snow, but the city is so much more quiet after all the holiday hustle and bustle is over. In this blog post I wanted to talk about my own personal style and the way I mix-n-match new designer with thrifted finds. I often feel that there is a perception that thrifted styles are shabby, old, outdated or even dirty. But all thrifted means is that someone owned it before you bought it. I cannot tell you how many articles of clothing I found thrifting that were in like-new condition or even still had the tags attached. The ensemble I picked to wear to Soho is a perfect example of mixing-n-matching thrifted with high quality new items. My Forever 21 sequin skirt was thrifted from Swap (still had the tags attached!) and my Mink Pink wool cropped coat was purchased at online thrift store ThredUp. My leather boots were an investment purchase from Nine West many years ago and have served me well for many years. This Coach oxblood handbag was a gift from a best friend gal pal and is definitely one of my favorites. Being a thrifter doesn't mean that you ONLY have to wear second hand items, you can pick and choose however you'd like. I will say that when I do purchase new items, I go for high quality. I will style my Burberry leather satchel with an all thrifted ensemble, but hey, that's just me! Scroll down to shop my collection of sparkly finds that you can totally rock in the daytime. Just like I mentioned before, they’re a mix of new designer pieces and awesome thrifted finds! The key to wearing sequins in the daytime, is to keep the rest of your outfit understated and neutral. Let your sparkle be the statement piece built upon a strong base of classic wardrobe staples. 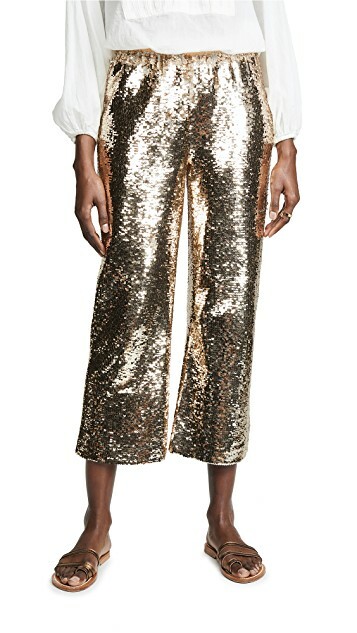 For a daytime look, pair sequins with denim, khaki, classic black or white tops and bottoms. You can layer sequins under blouses, sweaters, light jackets, even under or over dresses. Keep your shoes, makeup, and accessories casual and simple. It has been said that shimmer and sparkle are the new neutrals so don’t be afraid to experiment!